Secluded Setting down your tree lined driveway! 15 acres m/l to be surveyed! Mature trees around the property lines makes this a very private setting! This home was built for entertaining family & friends! Main floor great room with oak cabinets /w granite tops, access to deck, Main floor master suite, laundry, office and 2nd bedroom for guests or little ones. Main floor lounge/bar area with access to hot tub on patio & 3/4 bath. LL family room, bath, 2nd office & theater room. 2nd floor 4 bedrooms with walk in closets & 2 baths. Beautiful views off the deck overlooking the pond and woods! Covered front porch! Covered Deck located by the pond for entertaining! 4 Car Attached garage just off the mud room/drop zone area! Home is laid out for acreage living and children&apos;s needs as well! Building has heat & 1/2 bath. This property can be purchase with just 4 acres m/l as well. With 15 acres m/l there will be another parcel added, subject to a survey of land. © 2019 Northeast Iowa Regional Board of Realtors® Multiple Listing Service. All rights reserved. Information deemed to be reliable but not guaranteed. 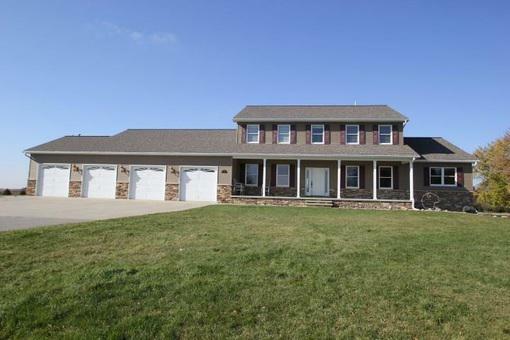 The data relating to real estate for sale on this website comes from the Northeast Iowa Regional Board of Realtors® Multiple Listing Service and the Broker Reciprocity Program. Real estate listings held by brokerage firms other than Inspired Real Estate are marked with the BR logo and detailed information about them includes the name of the listing Brokers. Listing broker has attempted to offer accurate data, but buyers are advised to confirm all items. Information last updated on 2019-04-20.